It had just turned 8pm and the lights went down. The Selecter were now on stage and boy didn’t they look awesome. Such taken aback how great the band looked and sounded I forget to keep note of what tracks they played but I’m sure they opened up with ‘Three Minute Hero’. From then on Pauline and Co delivered a set that would many bands away with tracks such as ‘James Bond’ and finishing with ‘Too Much Pressure’ where they managed to incorporate ‘Pressure Drop’ by Toots & The Maytals. There was no cashing in here! The Selecter have a real love for Ska and tonight it showed. PIL would certainly have to come up with something special as the headline band. Tonight begins with the warm reggae vibes of Talisman. A brightly dressed front man with happy messages of peace and love effortlessly creates a fun, relaxed mood. Talisman were at the peak of their band career during the early 80s and even headlined the Glastonbury Festival. The Bristol based foursome – long associated with the notorious ska label, Recreational Records – do a superb job of loosening up the crowd for The Selecter. Eight smartly dressed skanksters arrive on stage and we are immediately absorbed by the impact of their presence. Pauline Black and (Arthur) ‘Gaps’ Hendrickson take their narrative roles in tonight’s musical journey which fires off with a sizzling ‘London’s Burning’. Watching them live is so much better than listening to the records. The soothing rude-girl vocals of Pauline Black alongside Hendrickson’s raw Jamaican-style holler, combined with conventional keyboards, brass and beats, produces a naturally refined and authentic ska sound. This is clearer in the live show. Band members also customise their suits using trilbies, sunglasses and hankies in shirt pockets. The band is a complete package. The Concorde bounces in unison to the classic, upbeat sounds of ‘The Whisper’ and ‘Train To Skaville’. During ‘Celebrate The Bullet’ the tempo drops and the mood changes. It’s one of tonight’s slower tracks but carries a direct, universal message about the use of guns. A little rocksteady melody in ‘Think About That’ has us ready for an energetic spell as the set reaches a close. They play ‘James Bond’, ‘Three Minute Hero’ (which is the anthem of the night), ‘Missing Words’ and end with ‘On My Radio’. The Selecter save their biggest hits until later on and leave us with a lasting impression. An encore of ‘Too Much Pressure’ into a cover of ‘Pressure Drop’ (by The Maytals) is the icing on the cake. This band look good on stage, put on a great show and play great songs. They maintain the fun, feelgood vibes of other popular 2 tone ska bands of that era, such as Madness and Bad Manners, but present themselves more professionally as musicians and performers. The Selecter are irreplaceable and have made an influential mark on the world of ska. Although not as well known, the band is on a on par with The Specials, at least live. SKA bands from the turn of the ’80s continue to pull in the crowds in Newcastle. Madness and The Specials have played a number of sold-out gigs in recent years, and on Thursday it was the turn of Pauline Black and The Selecter. The gig, which was staged in the O2 Academy’s smaller room, was packed. That meant the floor was awash with a sea of Dr Martens, Ben Sherman shirts, braces and pork pie hats. as the Rude Boys (and Girls) came out in their droves. The support band, Bristolians Talisman, played a roots reggae set and really got the crowd going as the room was filling up. And by the time The Selecter took to the stage, the whole place was literally bouncing. These fans might not make fighting weight any more, but they showed that they really know how to enjoy themselves. The band have a new (pretty good) album String Theory out, and are touring in support of it. As well as Pauline Black, the current line-up of the band features fellow original singer Gaps Hendrickson. Their vocals were great, and the pair have a chemistry that is infectious. Two things stood out for me. Firstly was the amount of fun the band – I counted eight members – had on stage. And their energy was matched by the crowd. Secondly was that the new songs, including the incredible Warrior, fitted in seamlessly with classics like Murder, Missing Words and their version of the James Bond theme. This was a great gig by a band with many fans who turned up looking forward to a trip down memory lane. What I – and the rest of the crowd, I suspect – left with was an over-riding sense that there is still unfinished business for Pauline Black and The Selecter. A quick once over of the crowd assembled affront the Corner Hotel on Friday night and one might have found themselves thinking an over 40’s night that just so happened to coincide with a Ben Sherman sale was in full swing. It was always safe to assume that ska legends The Selecter would do a fine job of brining a few old-school punks out of the woodwork for their first Australian tour in their almost 40 year existence. However, the sheer number of brimming Doc Marten-clad baby boomers did their best to unnerve even the most stalwart 22 year old reporter into feeling both a little out of place, and boasting a naïve assumption that this gig may just fall into the let-down category as a result of an ageing and unenergetic crowd. As the eight-piece took to the stage it suddenly became clear that younger generations of music fans still have a lot to learn. 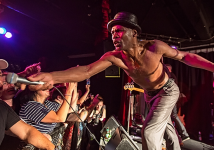 Across the course of an almost two hour onslaught of flawlessly executed and engaging 2-tone ska, Pauline Black and Arthur Hendrickson controlled the room with a level of expertise gained from almost four decades of experience as the venue erupted. “The reason we decided to re-form and tour again was because we thought, ‘maybe people had forgotten about 2-tone’?” Black announced between songs, delight clearly etched across her face as the rapturous crowd response affirmed that there was never any risk of this happening. A poignant interlude saw the band cover Amy Winehouse’s “Back To Black”, a starkly still moment within the room, as Black acknowledged her respect and admiration for Winehouse and the tragedy of losing such a young and gifted musician. Their most recognised anthems saw the most energised crowd reception, as the band cranked out ‘3 Minute Hero’, only to delve immediately into ‘Missing Words’, the room exploding into a storm of skanking at every saxophone wail and organ stab. A significant encore saw the group finally submit to calls for ‘Too Much Pressure’, ending their set to a room encapsulated and buzzing, showing no hints towards tiring. What really stood out about The Selecter seemed to not only be their affinity with their audience, and the almost flawless musical competency of the entire band, but the joy that seemed to be written across the faces of every member. This is a band that has been playing their own unique brand of music for decades, and had decided to reform not for money, or any additional fame, but for their un-adulterated love of the genre and the obvious fulfilment achieved when given the opportunity to share this with an audience. Further demonstrating that the sincere honesty, and the message of equality, acceptance and joy that exists within this somewhat overlooked style is still alive and well. Existing as a paradigm to the often sanctimonious and soulless intonations of much of modern music.